New York City is replacing busted old payphone booths with amazing free gigabit wifi hotspots in 10,000 locations around the city. We’ve already tested an early version of the new service and it’s fast. Now we finally know why. The blazing wireless internet—which we clocked at a ridiculous 400 Mbps—is enabled by components developed by Qualcomm, one of the three companies behind CityBridge. For those that are unfamiliar, CityBridge is the New York-based group of companies made up of Qualcomm, CIVIQ and Intersection. CityBridge is the group that’s working with the city to replace over 7,500 existing pay phones with ultra-futuristic fountains of reliable wifi. There’s a lot riding on whether or not the wifi works. New York City’s new gigabit internet service is the initial testing ground for a project that could be rolled out to cities around the world. LinkNYC isn’t an exception—especially as it’s the biggest public wifi project in history. 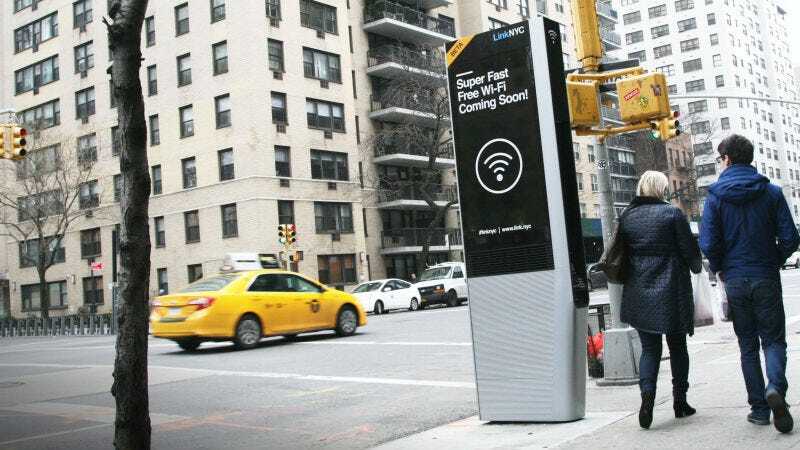 Kiva Allgood, vice president of Qualcomm’s Intelligent Solutions division, says LinkNYC is part of a Smart Cities initiative that aims to take similar internet infrastructure around the world—but it starts in New York. “We bring the wifi, all those antennas, and put them in a metal box,” Allgood told Gizmodo. “It does have to pay for itself. New York is unique with advertising.” The $200 million project will generate a lot of income through ads, which’ll play on big electronic displays on the side of each unit. Since New York brims with over 8 million data-hungry humans roaming the streets, those ads are prime real estate, especially when you consider LinkNYC’s mission of planting a Link every 150 feet. You’re probably wondering how each Link will be able to handle the hundreds of tired tourists huddling on the curb for a mini-binge of Orange Is the New Black. While we were told that LinkNYC is supposed to be something of a fleeting experience, allowing people to perform quick, on-the-go tasks like checking email, Allgood assured me that the tech inside each Link is built to withstand dozens of streaming video-watchers. Inside is MIMO wifi, which stands for “multiple in, multiple out.” It’s specifically designed to avoid traffic congestion by serving multiple devices simultaneously—useful when you’re serving throngs of smartphone-toting humans in America’s biggest city. So, even if a bunch of people did camp out for group YouTube parties, the Links should still be cranking out breakneck wifi for the crowds at all times. All that stuff is also what lets users browse the internet and access city maps and directions on the built-in Android tablets. Those tablets aren’t active yet, though. Allgood told me that in the next two weeks, Mayor de Blasio will host an event that officially activates the tablets. Once activated, New Yorkers will even be able to use them to pay utility bills, or make video calls on Skype. See? They’re still (kinda) like (futuristic) pay phones after all! We tested the Links here in Manhattan, and they are indeed awesome—their wifi crushed a nearby Starbucks’, and was even faster than the internet at the Gawker offices. While New York will continue blazing the trail for free omnipresent gigabit wifi (the idea is that there are so many units, you connect to the network once and you’ll never have to reconnect again), Allgood told me that Qualcomm’s looking to help take similar technology around the world. “We have several projects across the board, including seven or eight other cities internationally, including Latin America,” Allgood said. Other cities might not have Link-like devices that look exactly like New York’s, though. Some countries, including in Latin America, actually have laws that require payphones to exist on the streets, in order to accommodate citizens who lack mobile phones. So in those cases, Links may complement rather than fully replace. For now, though, the Big Apple is the world’s guinea pig. All eyes are on New York—and all of New York’s hands are on wifi-craving smartphones.